PITTSBURGH (AP) — If Le’Veon Bell is returning to the Pittsburgh Steelers later this month, he hasn’t let his teammates and coaches know. 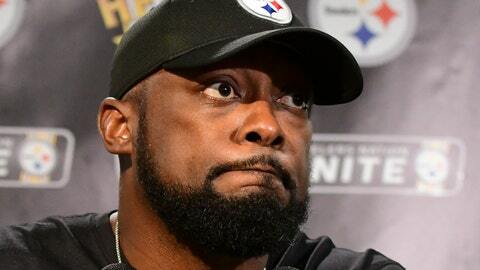 Coach Mike Tomlin said Tuesday he hasn’t heard from the All-Pro running back, who told ESPN on Monday that he will end his standoff with the team around Pittsburgh’s bye week, which begins after the Steelers face the Bengals on Oct. 14. The two-time defending AFC North champions have slumped during Bell’s self-imposed sabbatical. Pittsburgh is 1-2-1 a quarter of the way through the season thanks in large part to sluggish starts that have forced them to play from behind and abandon the running game. The Steelers ran for 19 yards on 11 carries in a loss to Baltimore on Sunday night. Several of Bell’s teammates — particularly the offensive line — expressed frustration in early September when Bell opted not to rejoin the team in time for the opener, as he did in 2017. Quarterback Ben Roethlisberger hopes Bell gives Pittsburgh a much-needed jolt, but isn’t exactly expecting Bell to show up and save the day, whenever that day actually arrives. Bell’s actual physical readiness is unknown. During the summer of 2017 he flooded his social media accounts with video of draining workouts. He was merely OK in his first 2017 appearance but quickly took off after that, eventually leading the NFL in touches and piling up 1,946 total yards. Concerns over his usage rate in 2018 perhaps hurting his value on the open market in 2019 played a role in Bell’s unprecedented move to remain away while the Steelers got off to their worst start since they dropped the first four games in 2013, his rookie season. That was also the last year Pittsburgh missed the playoffs. Though it’s still too early to panic, the way the Steelers have been losing has drawn major red flags for Tomlin. The defense is 30th in the league in yards allowed and 26th in points allowed and the offense can’t seem to get it going before finding itself in a hole. Pittsburgh has been outscored 42-6 in the first quarter this season. NOTES: The Steelers placed CB Nat Berhe on injured reserve with a torn pectoral and promoted CB Brian Davis from the practice squad to the 53-man roster. … WR Darrius Heyward-Bey (ankle) and ILB Vince Williams (hamstring) will be monitored this week and could play against Atlanta. … CB Mike Hilton (right elbow) and S Morgan Burnett (groin), both of whom did not play against Baltimore, may be available to face the Falcons.